Maryland Agricultural College (MAC), forerunner of the University of Maryland, is chartered on March 6. For a purchase price of $20,000, 428 acres of Charles Benedict Calvert’s Rossburg Farm is selected for as a site for MAC. Calvert and college trustees issue stock to help launch the institution. MAC is formally dedicated on Oct. 5. Joseph Henry, head of the Smithsonian Institution, is speaker and 34 students enroll; among them are the four sons of Charles Benedict Calvert: George, Charles, William and Eugene. Benjamin Hallowell (1799–1877) serves as president for one month after the opening of the college. John Work Scott (1807–79) is elected president but never arrives on campus. John M. Colby serves as president from 1860 to 1861. Henry Onderdonk (d. 1895) serves as president from 1861 to 1864. President Abraham Lincoln signs the Morrill Land Grant Act on July 2, providing federal support for state colleges to teach agriculture, mechanical arts and military tactics. Nine days later, MAC awards its first degrees to William B. Sands and Thomas Franklin. The Maryland legislature votes to accept a Morrill grant in February. Both sides in the Civil War spend time on campus: Gen. Ambrose E. Burnside and 6,000 men of the Union’s Ninth Army Corps stay on the grounds en route to joining Gen. Ulysses S. Grant in Virginia; and Gen. Bradley T. Johnson, and 400 Confederate men spend the night as part of Jubal Early’s raid on Washington. MAC President Onderdonk resigns following the controversy over the welcome afforded the Confederate troops. Nicholas B. Worthington, a magazine editor and professor, is named acting president. The Maryland legislature designates MAC as the land-grant institution for the state. As MAC faces financial problems, the legislature appropriates money for half-ownership and the college becomes, in part, a state institution. It fails to open in the fall. George Washington Custis Lee (1832–1913), the son of Robert E. Lee and a former major general on Jefferson Davis’ personal staff, is appointed president. Lee does not accept the appointment, for personal and political reasons, and never arrives on campus. Charles L.C. Minor takes over for Lee, and the college reopens in October with 16 students. Franklin Buchanan (1800–74) is president from 1868 to 1869. A native of Baltimore, Buchanan had been the first superintendent of the United States Naval Academy and the highest-ranking officer in the Confederate navy. The baseball team inaugurates intercollegiate competition with games against the Star Club of Laurel and St. John’s College. Samuel Regester, a Methodist minister, is named president. Enrollment is steady at about 100 students, and debts are paid off. Samuel Jones, a graduate of West Point and former Confederate major general, serves as president until 1875. Military training is emphasized and, in the next 15 years, only 49 students graduate. William H. Parker (1826-96) is president from 1875 to 1882. Parker, a New Yorker who was first in his class at the Naval Academy, served as a captain in the Confederate navy and founded the Confederate Naval Academy in Richmond. Augustine J. Smith, a commercial agent for a manufacturing firm from Maryland, serves as president from 1883 to 1887 and focuses on public relations activities to build support and loyalty among farmers, students and members of the state legislature. Smith accumulates a debt of over $15,000 and, pleading ill health, resigns. With the Hatch Act creating federally funded agricultural experiment stations (AES), the Rossborough Inn becomes headquarters for Maryland’s. Henry E. Alvord (1844–1904) is hired as both director of the AES and president of the college. The first Korean to earn a degree at a U.S. college, Pyon Su, is killed by a train shortly after graduating from MAC. He is buried in nearby Beltsville. Richard W. Silvester (1857–1916) serves as president from 1892 until 1912. MAC fields its first football team. College of Engineering, now the A. James Clark School of Engineering, is founded. Morrill Hall, the oldest academic building still in use, is built for about $24,000. Orville and Wilbur Wright lay out nearby College Park Airport, the oldest continually operated airport in the world. On Nov. 29, a fire that started at a Thanksgiving Dance destroys all dormitory rooms, half of the classrooms and offices and most of the college records; the loss is appraised at $150,000, but miraculously, there are no injuries or deaths. Silvester resigns. Thomas H. Spence (1867–1937), a professor of languages, serves briefly as acting president. Harry J. Patterson (1866–1948), a graduate of Pennsylvania State College and director of the Maryland Agricultural Experiment Station, is appointed president. On Sept. 18, Gamma Pi becomes the first fraternity established on campus. Chun-Jun C. Chen, of Shanghai, enters MAC as its first Chinese student. All four of his sons attend the University of Maryland as well. The state takes full control of college, changing its name to the Maryland State College of Agriculture. Elizabeth Hook and Charlotte Vaux, the first women students enroll. Albert F. Woods (1866–1948) is named president. He creates seven schools, each with its own dean: agriculture, engineering and mechanic arts, liberal arts, chemistry, education, home economics and the graduate school. Grace B. Holmes is the first woman to receive a bachelor’s degree. The College Park and Baltimore campuses are consolidated. Woods becomes president of the new University of Maryland (UMD). The Graduate School awards its first Ph.D. degrees, and total enrollment reaches 522 students, including 22 women. Sigma Delta becomes the first recognized sorority. The College of Arts and Sciences is founded. The student newspaper is named The Diamondback. Dean of Women Adele H. Stamp, namesake of the student union, arrives on campus. Stamp sees the number of women students grow from 103 in 1922 to 4,162 in 1960, when she retires. 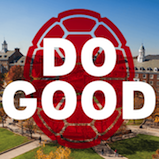 The Association of American Universities grants accreditation to UMD. Raymond A. Pearson becomes president of the university. UMD greatly expands in Baltimore and College Park, with 13 new buildings and additional acreage. The men’s lacrosse team wins its first national title, a feat it has repeated 11 times. Ritchie Coliseum opens to improve gymnasium facilities. A greatly expanded library, Shoemaker Hall, now the Counseling Center, opens. Members of the Class of 1933 donate the money for Testudo, the original campus statue of the diamondback terrapin that became the university’s mascot. The 300-pound bronze statue is placed on a pedestal in front of Ritchie Coliseum. H.C. “Curley” Byrd is appointed acting university president, and leads a huge expansion of buildings and enrollment. A 1908 graduate of MAC with a B.S. in engineering, Byrd began his 43-year career at UMD with a temporary two-week stint coaching football in 1911. He taught English and history, was athletic director and served as an assistant to Raymond Pearson before becoming president. The School of Commerce, now the Robert H. Smith School of Business, established. Reckord Armory opens with classrooms, a gym and space for ROTC activities. 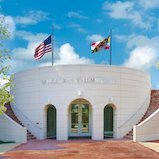 Used as a dorm for WWII veterans returning to UMD on the GI Bill, it was later named for Maj. Gen. Milton Reckord, adjutant general of the Maryland National Guard. Under the new GI Bill, enrollment doubles to nearly 10,000 students, with three-fourths living off campus. College of Journalism, which now bears the name of Philip Merrill, is founded. The College of Physical Education, Recreation and Health is established. Byrd Stadium, now called Maryland Stadium, opens. Hiram Whittle, the first African-American undergraduate student, enrolls. Three African-American students receive master’s degrees in education. Parren Mitchell, the first African-American graduate student to take all of his classes at College Park, graduates. Under head coach Jim Tatum, the Terrapins football team is declared national champions with a 10-1 record. Thomas B. Symons (1881–1970) is acting president of the university for nine months before Wilson H. Elkins takes over as president. Elkins emphasizes basic subjects and strict academic standards, unveiling an academic probation plan in 1957 and sending 18 percent of undergraduate students home. By 1964, 77 percent of freshmen are from the top half of their high school classes. The student union, later named for Adele H. Stamp, dean for women, is built. The University Senate is officially established on Sept. 23. Queen Elizabeth II of Great Britain and her consort, Prince Philip, visit campus for a football game as guests of Elkins and Maryland Gov. Theodore McKeldin. The contest is known afterwards as the Queen’s Game. After turning UMD down twice before, Phi Beta Kappa establishes a chapter. Tawes Fine Arts Building constructed. The School of Library and Information Services, now the College of Information Studies, is founded. Rebecca Carroll is the first African-American woman to earn a doctorate, in education. The School of Architecture, now the School of Architecture, Planning and Preservation, is founded. Charles Edwin Bishop is named first chancellor of the College Park campus. Hornbake Library opens as the Undergraduate Library, and was renamed in 1980 for R. Lee Hornbake, a faculty member who rose to vice president for academic affairs for the University of Maryland System. John W. Dorsey is named acting chancellor. Robert L. Gluckstern becomes chancellor. The University of Maryland celebrates the country’s bicentennial by planting the M Circle on Campus Drive. School of Public Affairs, now the School of Public Policy, is founded. William E. Kirwan is named interim chancellor. John B. Slaughter is chancellor. 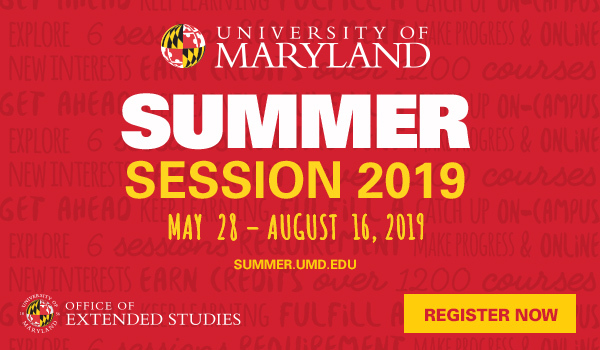 The five University of Maryland campuses are reorganized on July 1 to form the University of Maryland System; College Park is designated the flagship university, and the title of chancellor is changed to president. The university establishes its own alumni association. William E. Kirwan begins serving as president of the university. The business college moves from Tydings Hall to the new Van Munching Hall, named for benefactor Leon Van Munching Jr. ’50. The first students enter the College Park Scholars living and learning program. The College of Engineering is renamed the A. James Clark School of Engineering, in honor of the 1950 alumnus and benefactor. The Robert H. Smith School of Business is given the name of its 1950 alumnus and benefactor. Artist Clarice Smith, wife of Robert H. Smith ’50, gives a generous gift to the new performing arts center. Clayton Daniel (Dan) Mote Jr. is inaugurated as president of the University of Maryland. The Terps men’s basketball team, led by head coach Gary Williams, wins the NCAA national championship by defeating Indiana, 64-52. The Comcast Center, now called Xfinity Center, opens. features exposed building systems and construction components that serve as teaching tools. The Samuel Riggs IV Alumni Center opens, named for a 1950 alumnus. The women’s basketball team, coached by Brenda Frese, wins its first NCAA championship, beating Duke 78–75 in overtime. UMD becomes one of only two schools in history to have won the NCAA championship in men’s and women’s basketball. The School of Public Health, formerly the College of Physical Education, Recreation and Health, is founded. John S. and James L. Knight Hall opens as the new home of the Philip Merrill College of Journalism. The University Honors Program, which included Gemstone and Honors Humanities, is converted to the Honors College. University Honors becomes its own living and learning program, and new interdisciplinary living and learning programs are launched. Provost Nariman Farvardin serves as acting president for two months, until Wallace D. Loh becomes the 33rd president of the University of Maryland. The College of Chemical and Life Sciences is integrated with the College of Computer, Mathematical, and Physical Sciences to form the College of Computer, Mathematical, and Natural Sciences. The field hockey team wins a second consecutive national championship over North Carolina, 3-2. Coach Missy Meharg has led the team to seven of its eight championships. UMD and University of Maryland, Baltimore forge a new partnership known as MPowering the State to expand academic and research programs, technological research and commercialization, and public service. 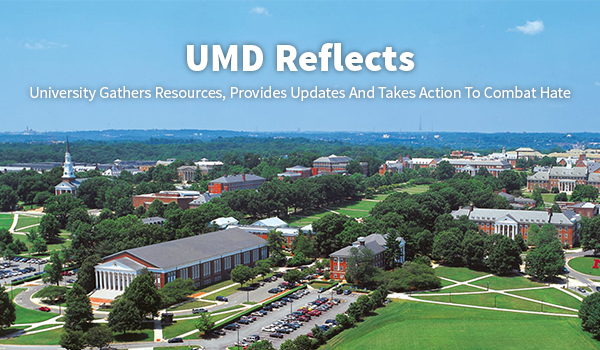 UMD completes the record $1 billion Great Expectations fundraising campaign. UMD begins athletic competition in the Big Ten Conference. The Physical Sciences Complex opens, housing the physics and astronomy departments, the Institute for Physical Science and Technology and the Joint Quantum Institute. UMD receives a record-breaking $31 million gift from alumnus Brendan Iribe to help build a new computer science building and fund scholarships. UMD launches a partnership with the Phillips Collection art museum. The Frederick Douglass statue on Hornbake Plaza is dedicated. The women’s lacrosse team wins a second consecutive national title. It’s the 13th title in program history, including seven straight from 1995–2001, the third longest streak in Division I women’s athletics. Information provided by University Archives.